With the awareness of mental illnesses rising, there is no better way to put it than the harmony of pictures that speak more than words can convey. Janelia Mould-Cheeky Ingelosi is a South African photographer whose works are mainly focused on the wonders of her mind via conceptual photography. She incorporates both nature and realism in her artworks; consistently conveying strong messages through the ethereal beauty of these two concepts. ‘Melancholy—a girl called depression’ is no different. For those who have never experienced depression, it can be an obscure feeling of dejection, yet Ingelosi perfectly captivates it with her own personification of the condition. 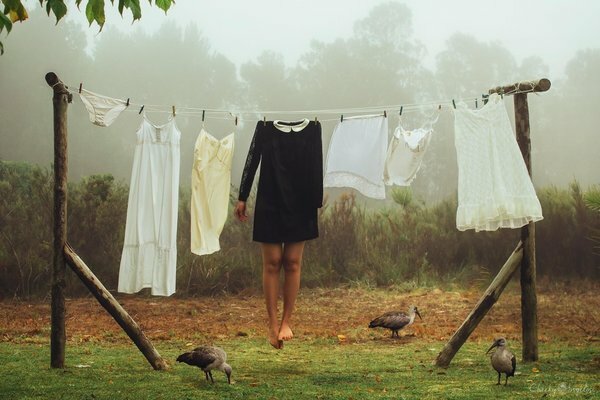 The character in the series comes without a head, and sans arms in a few of the photographs. It depicts the feeling of hopelessness and emptiness; having almost nothing left of her to go on—explaining the reason behind the character’s legs remaining attached throughout the series. Regardless of the hike in awareness of mental illnesses, many who suffer from it would rather hide in its shadows than to have a voice for themselves. Ingelosi is hopeful her photo series will help as a stepping stone for those who are afraid to seek help.